Google Analytics’ Site Speed reports are pretty darn great. They report automatically on various milestones in the process the browser undertakes when rendering content. These reports leverage the Navigation Timing API of the web browser, and they are (typically) collected on the first Page View hit of a page. And this is all fine. As I said, it’s a great feature of Google Analytics, and lends itself handily to spotting issues in the quite complex client-server negotiation that goes on when your web browser requests content from the web server. However, there’s a glitch. 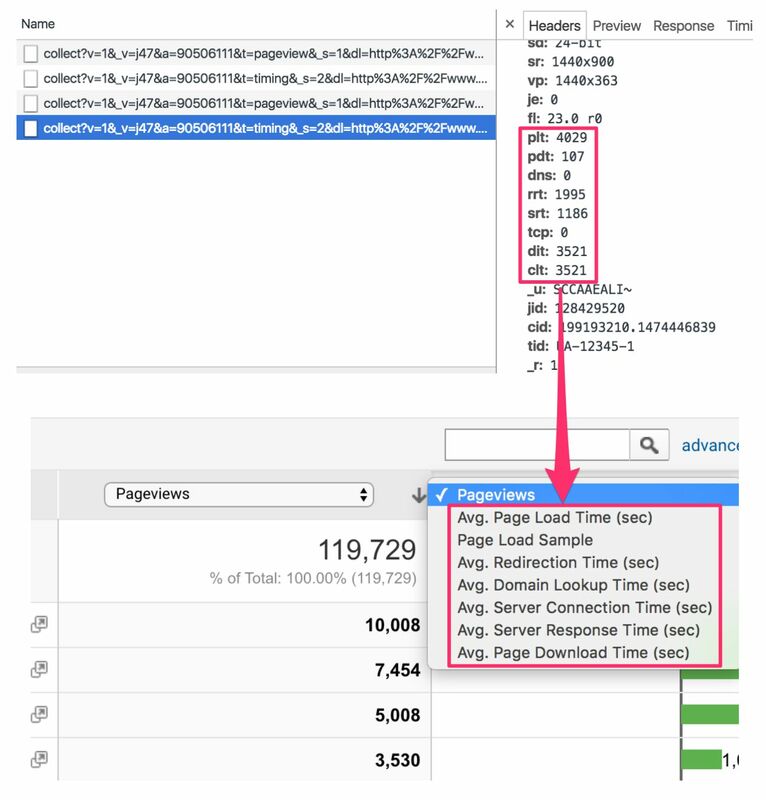 These automatic page timings are collected once per tracker instance per page, meaning if you have multiple trackers on the page, each set to collect site speed samples, you might inadvertently send the same page speed data multiple times. This will naturally inflate the numbers that Google Analytics reports on, and your data will be ruined, as deduplication is really difficult. If any of these rang true, you might have a data quality issue that should be fixed immediately. That’s two separate Page View hits firing on the same page, you’re still fine. Since they use the same tracker object (the default tracker), even if you win the odds and manage to hit the 1⁄100 twice on the same page, the page timing data is only sent once, since Universal Analytics only sends timing data once per tracker per page. If both these trackers collect to the same Google Analytics property (UA-XXXXXX-Y), and if both trackers manage to somehow make the 1⁄100 cut, you will be sending the same page timing data twice, just for different page paths. And that will warp your data! Google Tag Manager, for all the good it does, has one complication that makes a lot of things difficult: it assigns a unique tracker object for every single tag that fires - even if it’s the same tag firing multiple times. Take another look at the image at the beginning of this article. There you have a Page View Tag which has the siteSpeedSampleRate set to 100%, which means that every single time the Page View hit is sent, it should be used to sample page timing data. It also has a Trigger which fires whenever a Custom Event is pushed into dataLayer. So this is your typical “virtual” Page View (man I hate that term - all Page Views are virtual!) Tag, set to fire with a custom page path whenever the event triggers. Every single time this Page View Tag fires, it will send the same page timing data to Google Analytics! That’s multiplication on a grand level! It’s even more confusing since the same page timing data is sent to multiple page paths, making deduplication in the reports really difficult to do. Here are some obvious fixes to this issue. 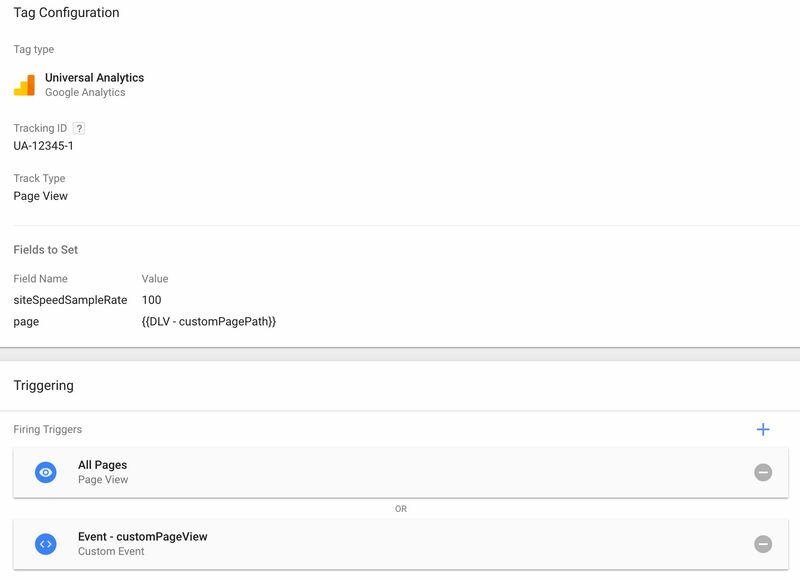 This is pretty easy if you’re using the Universal Analytics snippet. Set siteSpeedSampleRate to a proper value in only one tracker, and set all other trackers to 0. This would ensure that only a single set of page timings is sent per page. 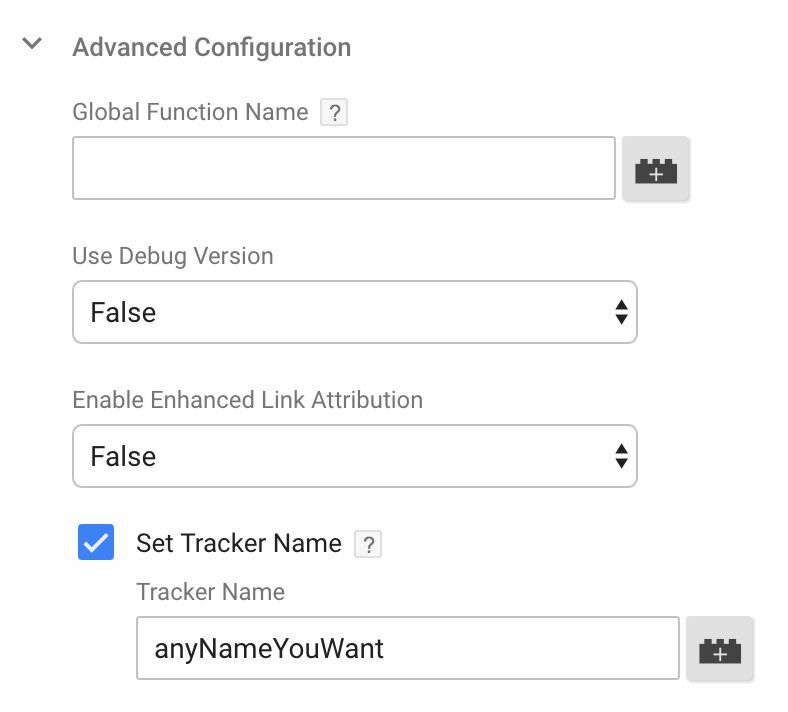 In GTM, by default, this would be impossible, because each tag has its own unique tracker name. 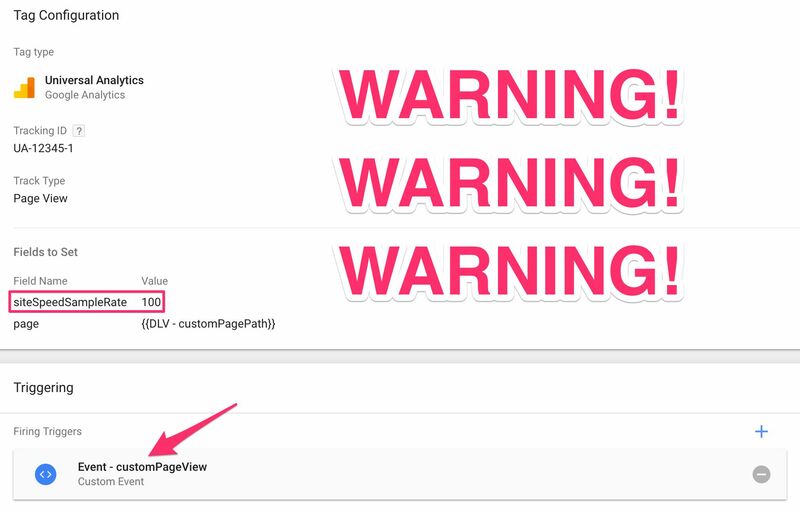 This is irrelevant in Universal Analytics, as only the first pageview per tracker is sampled anyway. In Google Tag Manager, however, this might just fix the issue for you. Now, this Tag will be problematic if left like this, since the Page Timing sample will be sent every single time the Tag fires - once for the All Pages Trigger, and each time the Custom Event Trigger fires. In other words, only the All Pages Trigger will send the site speed sample, ensuring it is only sent once on the page. If you don’t have the means to distinguish the first Page View from all the subsequent triggerings, you could also add hitCallback to your Page View Tag, which sets a global flag (or even a dataLayer variable) to true, indicating that the tag has fired (at least) once. Then you can use this flag as a condition for the siteSpeedSampleRate field, only sending the 100 value if this flag is false. You can set it to whatever value you wish, though I advice against leaving it blank. If you do leave it blank, it uses the default Universal Analytics tracker and can lead to issues, unless you are really on top of your site’s GA implementation. There are risks when setting the Tracker Name field, and I recommend you read my article on the topic before proceeding with the method. The Site Speed reports are really great, but you might want to go over your Universal Analytics implementation to make sure you’re not involuntarily collecting bogus data. As long as you keep in mind that the page speed sample is collected once per page per tracker, you should be able to identify if there are issues in your setup. In this article, I have outlined three different things you can try, but there are other methods you can employ too, with just a little creativity.